A 777 filled with journalists, musicians and crazy Rihanna fans jetting around the world for 7 concerts in 7 countries over 7 days ... what could go wrong with that right?? Apparently a lot. Judging from this Fuse video it's devolved into a streaker party plane. 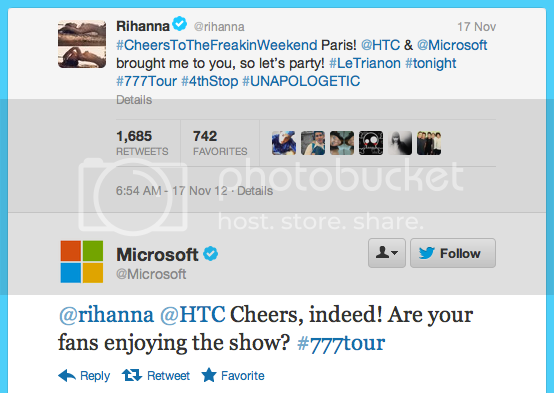 Even worse for the tour's Apple-rival sponsors, HTC and Microsoft, it looks to be an iPhone-filled streaker party plane! While, Microsoft is in the midst of running its biggest ad campaign ever to take down the iPhone, HTC has been embroiled in a lengthy legal battle with Apple over patent infringement. Both are sponsors of the tour along with UK fashion retailer, River Island.